Around a year ago, A moved out of north west London where he grew up, and moved into the Docklands, where his grandparents were raised. The Jewish community that lived on and around the Whitechapel Road and Cable Street are long gone (according the the last census, a mere 1,200 Jews are left in Tower Hamlets) as are the working class Anglo-Saxon stevedores from whom C is descended (it turns out C's grandparents were living in the East End at the same time as A's - small world). The area around Whitechapel, Shadwell and Limehouse now seems to be inhabited by yuppies, who find it convenient for the City or Canary Wharf, and a large Bangladeshi community. This community is centred around the so-called "Banglatown", with Brick Lane and the East London moque at its heart. However, some of the best eating is not to be had on the main drag of Brick Lane itself, but on the surrounding streets. It's here, on the uninspiring trunk road that is the Commercial Road, that you'll find the Lahore Kebab House. 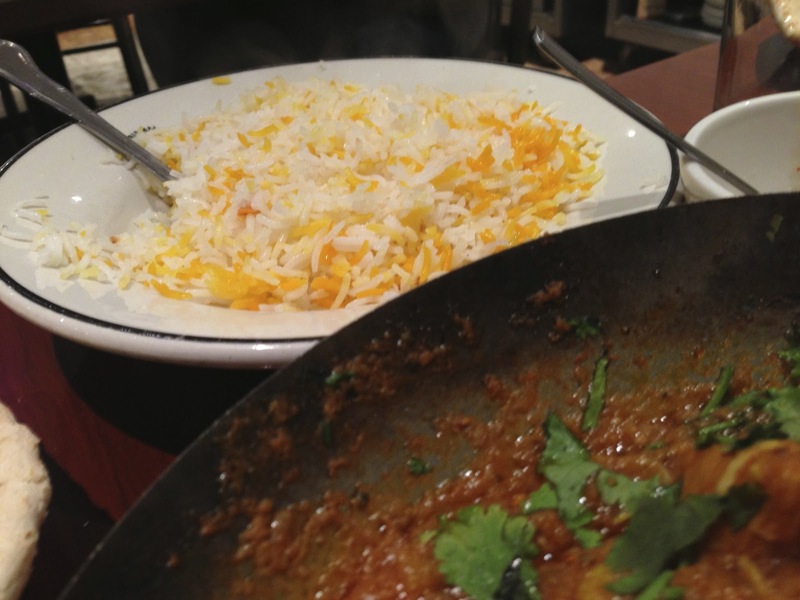 In recent decades, Indian food has become almost as British an institution as the Sunday Roast. 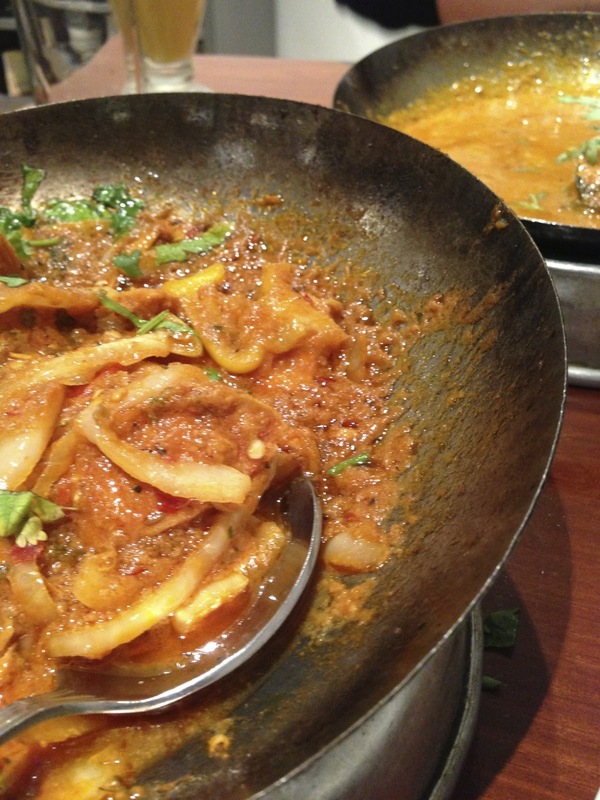 The UK has made Indian food its own, adapting it to suit the local palate. 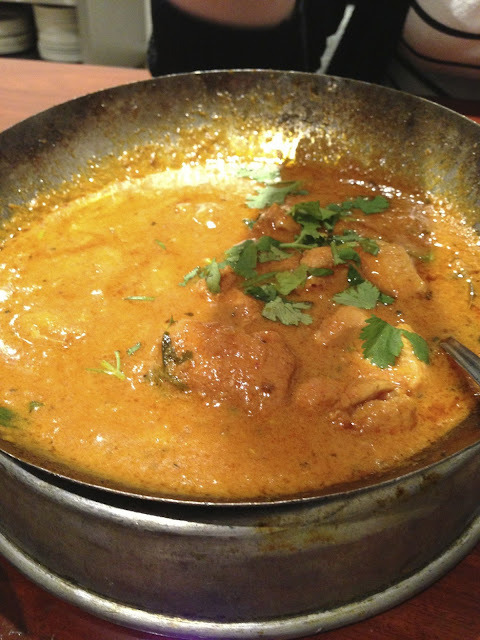 Indeed, some dishes such as chicken tikka masala were invented in the UK, and some would say that they are as much the British national dish these days as beef wellington or fish and chips. The popularity of Indian cuisine has been brought to the fore largely by restaurants such as the Lahore Kebab House, and other regional curry institutions such as Akbar's in Manchester, the Shish Mahal in Glasgow and the Aagrah in Leeds. Nowadays, even the smallest village will have a balti house, churning out dishes such as lamb dopiaza and chicken dhansak at reasonable prices. But moving away from British culinary history and on to the joint itself, C dragged A out to the Lahore Kebab House after nearly a year of living on its doorstep. Confusingly, the Lahore Kebab House does not serve kebabs, but curries. Along with Tayyabs, the Lahore Kebab house is probably the most famous Indian restaurant in the East End, and its reputation precedes it. Fortunately, C made the right call and the hype is justified. We basically ate our way through the menu as the place is so affordable that you almost feel you have to. As is traditional with a British curry, we started the meal with poppadums, which came with the usual luminous yellow mango chutney. Speaking honestly, these aren't much to write home about, but then again it's hard to do anything amazing with these things (though the Shish Mahal does a very fine job, if you're ever in the area, with its own amazing spiced onion chutney). 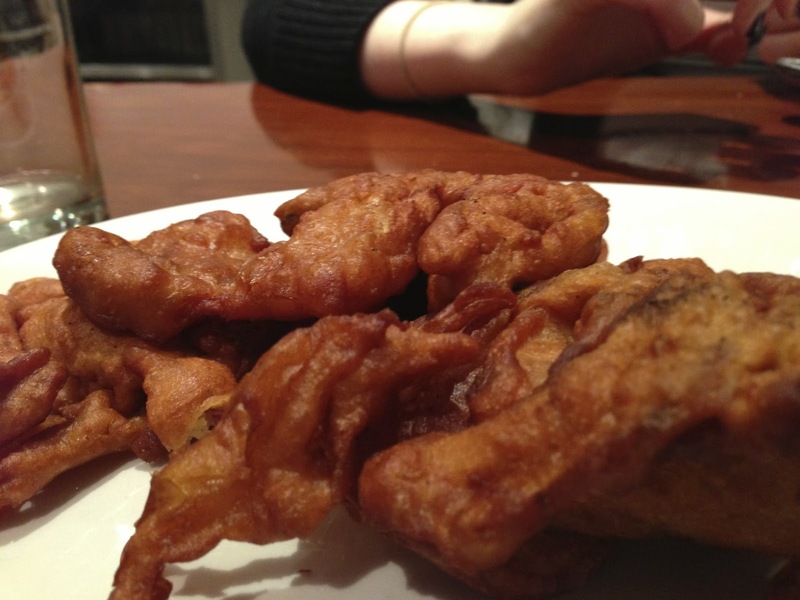 After we'd polished these off, we tucked into a delicious plate of onion bhajis. Delicately spiced, crispy and moist, these made for an excellent starter and really set the tone for the rest of the meal. We then ordered a curry each - C went for a korma and A opted for the jalfrezi - and both options were excellent. Some places go for heat and fat to mask the fact that the curry is poor, but not here. Each curry were well spiced, and critically they weren't too heavy on the chili or ghee. 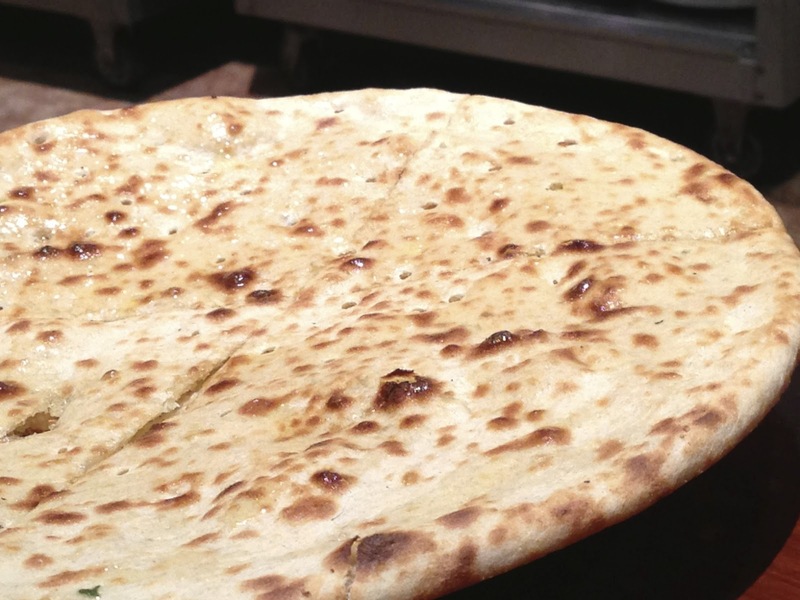 We also went a bit crazy on the side dishes, ordering a plain naan, a pashwari naan and rice. While everything was delicious, we ordered such volumes of food that we didn't have a hope of finishing it all. On top of the food being great, the portions are really generous, which is always nice to see. 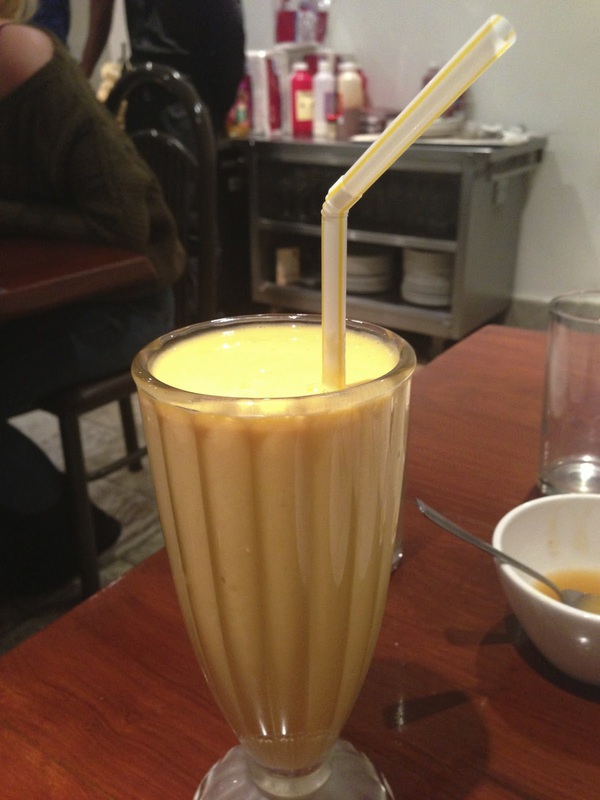 If that wasn't enough, our South Asian banquet was washed down with a brace of mango lassies. 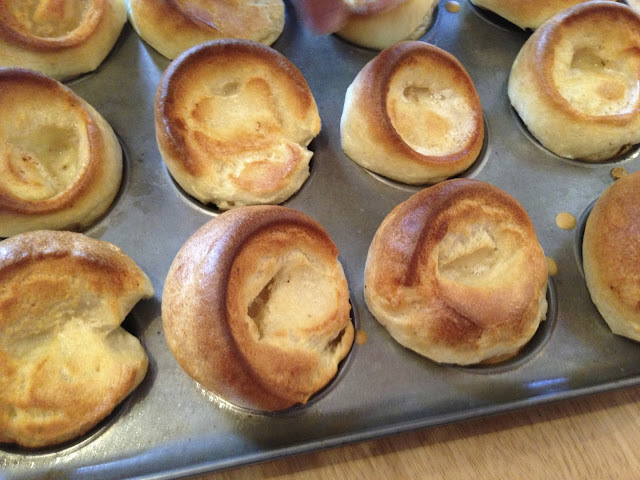 As with everything else, these were excellent: sweet but not sickly and bursting with mango flavour. In short, we cannot recommend this place highly enough. This place is hyped, but it's hyped with good reason. We loved it, and we're sure you will too. The Lahore Kebab House is worth travelling for, and given its proximity to Aldgate, Aldgate East, Whitechapel and Shadwell stations, there's really no reason not to go!